The bench asked the BJP government not to take any major policy decision till it proves its majority in the house. New Delhi: In a setback to the Bharatiya Janata Party, the Supreme Court has advanced the floor test in the Karnataka assembly to 4 pm on May 19 – slashing the 15-day window given by governor Vajjubhai Vala to BJP chief minister B.S. Yeddyurappa to prove his majority. “Let the house decide and the best course would be floor test,” a three-judge bench comprising Justices A.K. Sikri, S.A. Bobde and Ashok Bhushan said. The top court said the pro tem speaker will take decisions in accordance with the law on the issue of the floor test. By convention, the pro tem speaker is the “senior most” member of the legislature; according to The Hindu, the Vidhan Soudha secretariat had recommended the name of eight-time Congress MLA Raghunath Vishvanath Deshpande to the governor along with two other names – Umesh Katti and Yeddyurappa of the BJP. However, reports from Bangalore indicate the governor has appointed K.G. Bopaiah of the BJP pro tem speaker. His task will be to administer the oath of office to all the elected MLAs and then oversee the election of the assembly speaker. Though it is the latter who normallys oversee the vote of confidence and not the pro tem speaker, Friday’s Supreme Court order says the pro-tem speaker will conduct the floor test. The Congress has said it will move the Supreme Court over the governor’s decision to appoint Bopaiah. In response to the Congress’s requests, the apex court also directed the Karnataka government and the governor not to nominate any MLA from the Anglo-Indian community to participate in the floor test. The bench also asked the BJP government not to take any major policy decision till it proves its majority in the house and rejected Yeddyurappa’s request that the vote of confidence be conducted in the assembly via a secret ballot. The apex court made it clear that it would deal with the constitutionality of the governor’s letter inviting Yeddyurappa to form the government later. The bench said ultimately the question is about majority which has to be proved in the floor test. Senior advocate Mukul Rohatgi, appearing for Yeddyurappa, had sought time till Monday for the floor test but the bench ordered it for Saturday. During the hearing, which went on for more than an hour, Yeddyurappa placed before the apex court letters he had sent to the governor in which he had staked claim to form the government. Yeddyurappa, who was sworn in as the chief minister of Karnataka yesterday, argued that the BJP as the single largest party had the “mandate of people”, who had thrown out the Congress. Rohatgi told the bench that there was no pre-poll alliance between the Congress and JD(S) and that they had formed an “unholy alliance” after the elections. The apex court was hearing a petition moved by the Congress-JD(S) combine challenging the governor’s decision to invite the BJP to form government. “The single largest party (BJP) [has] the mandate of [the] people of Karnataka who have thrown out the ruling party. The ruling party has much less members than us. There was no pre-poll alliance. It (Congress-JD(S)) is an unholy alliance,” Rohatgi said. Venugopal told the bench that Yeddyurappa was being represented by Rohatgi, who placed the letters before the bench. The bench directed Rohatgi to give copies of the letters to the counsel appearing for the Congress-JD(S) combine. 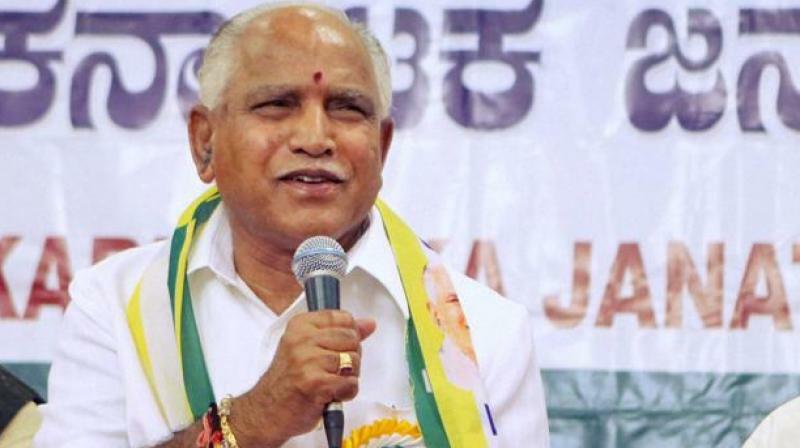 Rohtagi, while reading out the operative part of the May 16 letter sent by Yeddyurappa to the governor, said the BJP leader had said in the letter that the party has emerged as the single largest party in the state and they were wiling to form the government. He also said that the BJP leader had requested the governor to invite the party to form government and had also said that they would provide a “stable government” and they have the “support of others”. Congress President Rahul Gandhi today said the Supreme Court order on floor test in Karnataka was a vindication of the party’s stand that the governor acted “unconstitutionally”. Taking to Twitter, Gandhi said the court has called out BJP’s “bluff” of forming a government even without the numbers and alleged that the party will now resort to using money and muscle power to “steal” the mandate. “Today’s Supreme Court order, vindicates our stand that governor Vajubhai Vala acted unconstitutionally,” he said on Twitter. He also said that the party has been stopped legally from forming their government as they do not have the numbers. “The BJP’s bluff that it will form the government., even without the numbers, has been called out by the court. Stopped legally, they will now try money and muscle, to steal the mandate,” he said. The BJP, which emerged as the single largest party with 104 seats in Karnataka assembly, was invited by Vala to form the government. In a pre-dawn hearing, the top court had yesterday refused to stay Yeddyurappa’s swearing in. A specially constituted three-judge bench, after more than three hours of hearing, had said that it was not interfering with the governor’s decision to invite the saffron party to form government in the state. The court had directed the Centre to place before it two communications sent by Yeddyurappa to the governor in which he had staked claim to form government, saying their perusal was necessary to decide the case.